A Wintry antipasti spread. Photography by Tasha Seccombe. I’ve heard so much about the health benefits of fermented vegetables. It activates the right elements for a healthy gut and will add longevity and “feel-good” to your life. Vladia Cobrdova wrote a book as Wellness Ambassador for the Australian whole food brand About Life, where her focus is all about raw food recipes, whole food, activated, pickled and fermented food, and general goodness. She has also inspired me not to forget about entertaining antipasto-style during Winter, where you can add many flavourful pickles and fermented veg to your board, as well as raw pestos and other delicious items. Pickling vegetables is also a great way of minimizing waste and saving up stock for a “rainy day” – a delicious, lasting treat from your own cupboard. 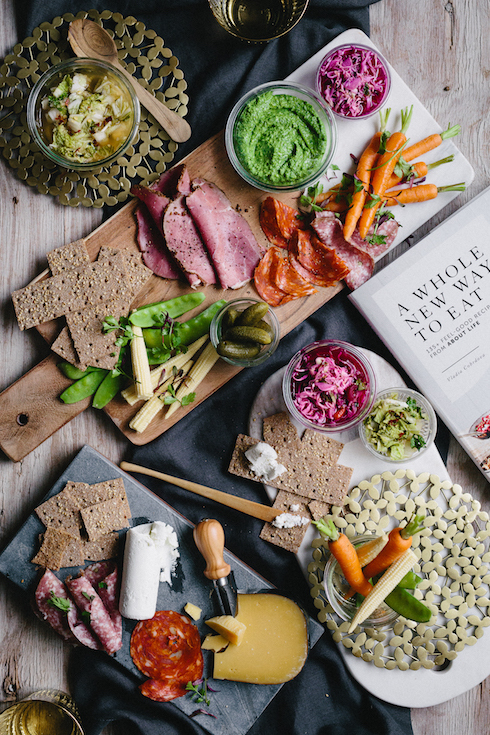 Serve the pickles with an array of delightful charcuterie, cheeses and wholesome rye crackers. Check out my •notes for substitutes on some of the exotic ingredients. Find Vladia’s book A Whole New Way to Eat at Poetry Stores, along with Poetry’s new range of beautiful marble and wood serving boards – perfect for serving antipasti. 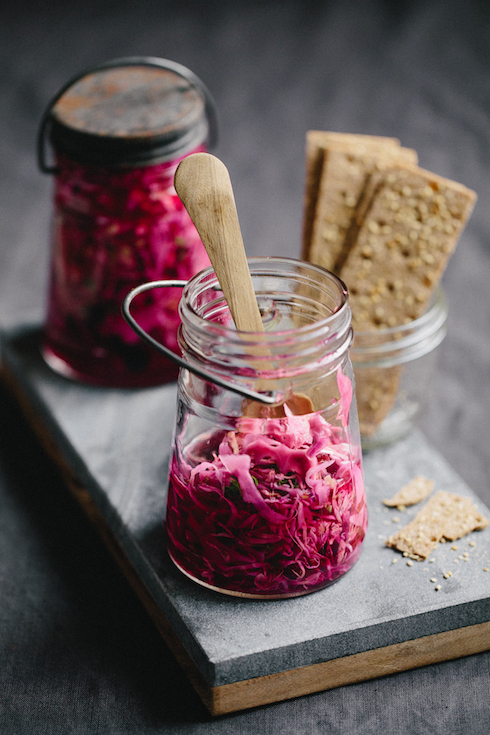 Beautiful bright pink pickled cabbage. Photography by Tasha Seccombe. Put all of the ingredients in a large bowl with 375 ml water and combine well. Transfer to a large jar or airtight container and press the cabbage down firmly to compact. If necessary, add a little extra water to cover the cabbage, ensuring it is submerged in liquid. Seal and refrigerate for 2 days before serving. 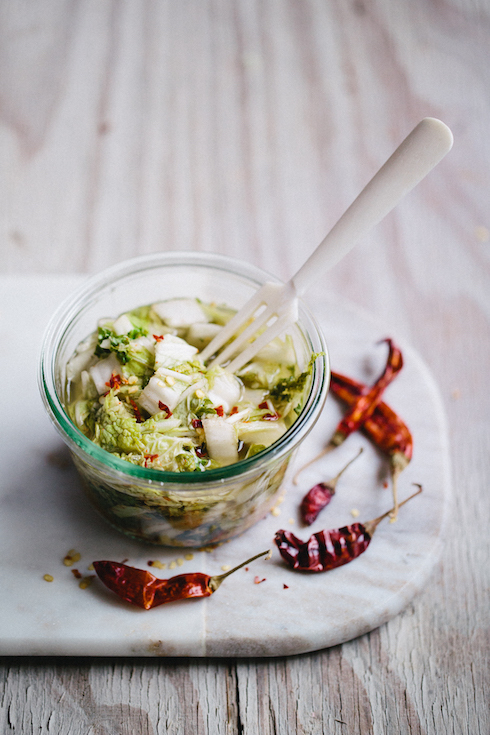 Chinese cabbage makes the best ingredient for pickled kimchi. Photography by Tasha Seccombe. Put all of the ingredients in a large bowl with 375 ml water and combine well. Transfer to a large jar and press the contents down tightly. If necessary, add a little extra water to cover the vegetables, ensuring they are submerged completely. Seal and refrigerate for 2 days before serving. *My notes: I couldn’t find inca berries in any of the supermarkets or health shops in Stellenbosch, so I left it out completely. You can substitute the raw sugar for palm sugar or white sugar. 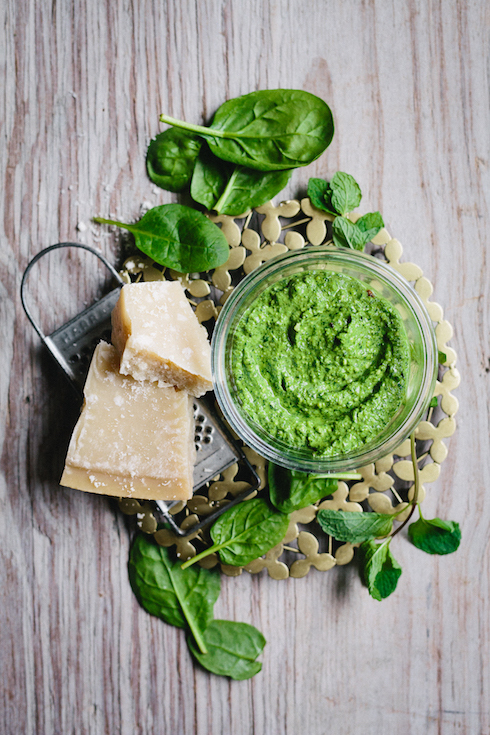 Cream mint pesto with spinach, cashews and parmesan. Put all the ingredients in a blender with 2 tablespoons of water and process until smooth. Transfer the pesto to a small airtight container, level the top, then pour a shallow layer of extra virgin olive oil over the prevent it from oxidising. The pesto will keep for up to 3 days in an airtight container in the fridge. Serve as a dip, dressing or pasta sauce; use it on fish or with meat. *My notes: Pine nuts can be quite expensive – substitute with more cashews if you want. Kefir is a fermented milk drink – substitute with Greek yoghurt if you cannot find it. This new book from Amandip Uppal, Indian Made Easy (available from Poetry Stores), is simply stunning. I love the lay-out, the fonts, the simplicity of the colours and the photographs too. 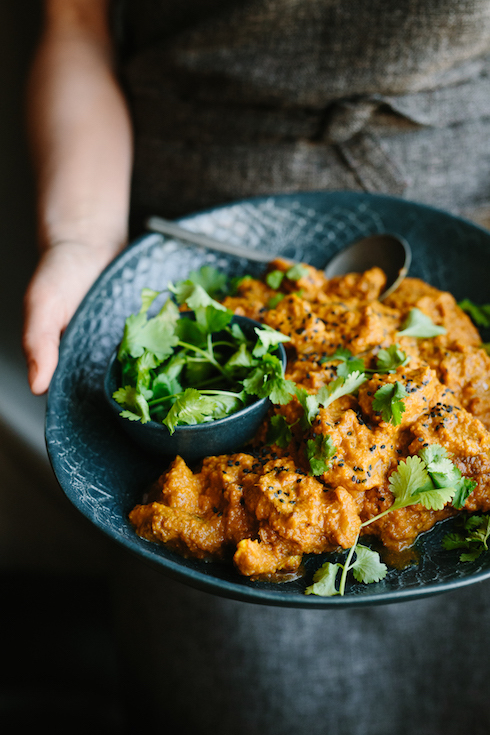 Amandip also chose to do something interesting with her recipe lists, listing fresh ingredients together, spices together, and pantry ingredients together. It makes a lot of sense when you shop for the ingredients, or when you get everything together before cooking, but I found that some inexperienced cooks might become confused mid-cooking when an ingredient is mentioned but it does not appear in the order of the cooking process. For my readers’s ease, I’ve rearranged the ingredients below in the order of how it will be used. Amandip’s recipes are really flavorful and beautiful to look at – an easy intro to the fabulous world of Indian cooking. Plate up on Poetry‘s beautiful new dark blue “lace” tableware. 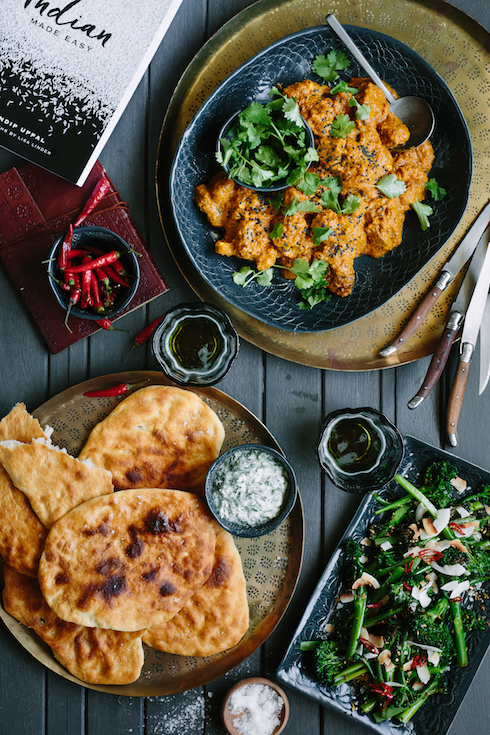 Recipe from Indian Made Easy by Amandip Uppal. Heat the oil in a large deep frying pan over low-medium heat. Add the mustard seeds and fennel seeds and fry until the crackle and pop. 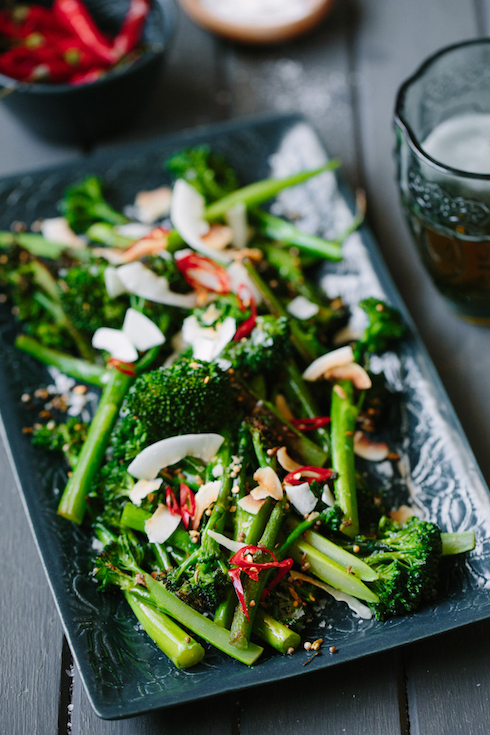 Add the garlic, chili and broccoli and fry until the broccoli is slightly charred in colour. Reduce the heat, cover and cook for 4-5 minutes, until cook the through. Uncover, season with salt to taste and add the ginger. Toss through and gently cook for 20 seconds. Garnish with a scattering of tasted coconut, pomegranate seeds and coriander and more coriander leaves and stalks. My notes: This recipes is also excellent served at room temperature. Put the mint leaves, dried mint, garlic, cumin seeds and salt in a mortar. Grind with the pestle to make a smooth paste. Place the spinach into the bowl, together with the mint paste and stir in the yoghurt. Garnish with the ginger and chilli, if liked. Mix the yeast, sugar and water. Stir well with a fork and leave for a few minutes. Place the flour, 2 tablespoons gee or oil and salt into a wide bowl and make a well in the centre. Using one hand, pour in a little of the yeast mixture and with the other hand use a fork to gradually bring the flour in and mix together. Keep pouring a little water while mixing. Flour your hands and begin to knead and form a ball. Add enough water to make a soft, but not sticky dough and keep kneading for about 5 minutes, or until smooth pliable and soft. The consistency should bot be very soft or hard. Cover and rest for 20-25 minutes. Using slightly oiled hands, divide the dough into about 8-10 equal sized balls. Place on a lightly oiled tray, leaving gaps in between each ball and over with a damp tea towel. Leave in a warm place for about 20 minutes until the balls have doubled in size. Preheat the grill to medium-high with a heavy based baking tray on the top shelf. Roll out the dough balls thinly and evenly. 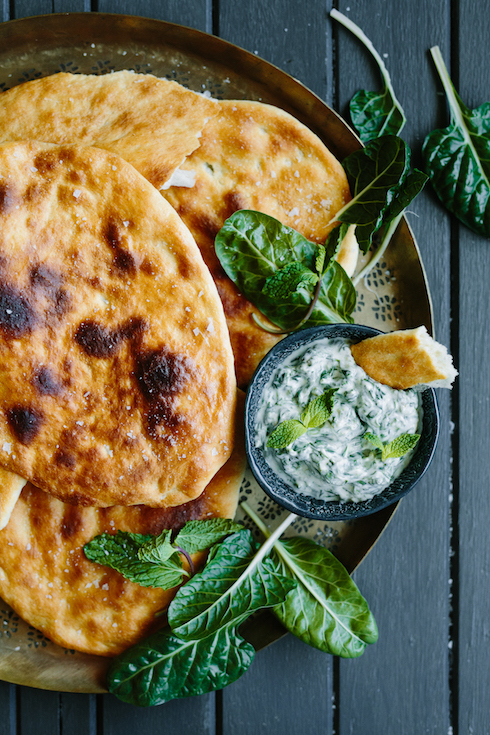 One by one, place the rolled out naan onto the baking tray, brush lightly with water and grill for about 1-2 minutes on both sides, or until lightly browned and puffed up. Lightly brush with ghee and serve hot. My notes: The recipe didn’t state how/where to roll out the dough, so I did it on a floured working surface (some naan recipes call for an oiled surface). Be sure to also dust the baking tray lightly with flour to prevent the naan from sticking to it. In a blender or using a mortar and pestle, grind the onions, green chillies, ginger, garlic, oil and tinned tomatoes into a smooth paste. Mix the paste with the garam masala, cumin, ground coriander, chilli powder, turmeric and salt. Place the lamb in a large bowl and cover in the paste, making sure all the pieces of lamb are well coated. Put the lamb in a heavy-based saucepan over a low heat, cover and cook for 35-40 minutes, stirring frequently until the meat is tender and the oil has separated. Add the yoghurt, then cover and cook for a further 5 minutes, stirring constantly over a low-medium heat. Remove from the heat, then sprinkle with the chopped coriander and a large pinch of ground cumin and serve. My notes: I’ve found that the meat needed longer time to cook than mentioned 35-40 minutes. I cooked mine over a low heat, covered, stirring every now and then to prevent the bottom of the pot from turning too dark, for about 2,5 hours until it was really tender. A delectable home cooked feast from Barbara Joubert’s book KOSTALGIE, available from Poetry Stores. Photography by Tasha Seccombe. There’s nothing that says “I love you” like a thoughtful, scrumptious and beautiful home-cooked meal. 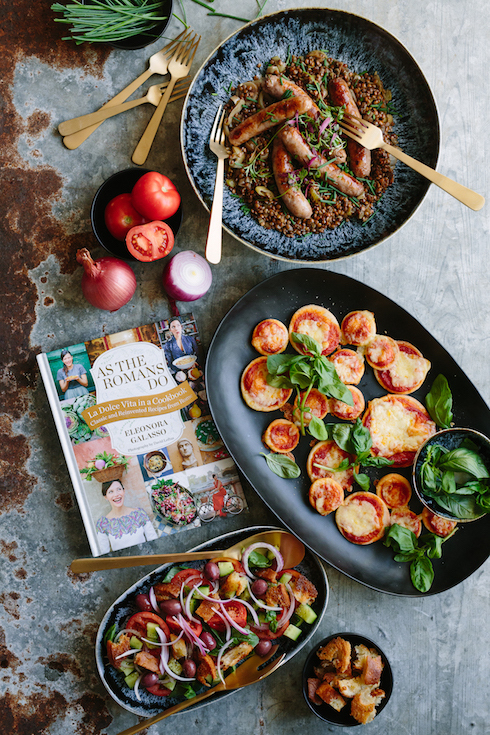 The recipes in Barbara Joubert’s (Afrikaans) book Kostalgie are the perfect choices for a Mothers Day lunch at home, with flavours and influences from her travels all around the world. I have never made caramelized figs before, and they truly are just magnificent to look at. Almost too beautiful to eat! With the creamy custard tart, they are the stuff dreams are made of. I love slow roasted pork – it seems to always get raving reviews in my house. I opted for serving the pork with buttery beans instead of potatoes, because of my choice of pasta and tomatoes as a side dish (a stunning meal on its own too). Have a happy Mothers Day everyone! Barbara’s book, the homeware and beautiful black floral scarf are all available online and in store from Poetry Stores. Place the flour in the bowl of an electric mixer with dough hook. Make a well in the middle of the flour and add the eggs. Switch the machine on at low speed. Add the olive oil and water. Increase the speed until a soft dough forms. If the dough is too stiff, you can add a little water. Knead for 10 minutes with the machine, then take the dough out and cover with plastic wrap. Let it rest for 1 hour at room temperature. If you have a pasta machine, sprinkle a little flour on your working surface and on the rollers of the machine. Cut the dough into smaller pieces. Set your machine on number 7 and feed the dough through. Set it one setting lower, feeding the dough through until you get to number 1 (the thinnest setting). Hang the pasta sheets over the back of chairs for about 20 minutes to dry out a little. Attach the tagliatelle attachment to the machine, then feed the sheets through the cutter. Place the bundles of cut tagliatelle onto a baking tray sprinkled with flour. Bring a large pot of water to a boil. Add a little olive oil, then add the pasta and cook for 3-5 minutes. Drain and top with the roasted saucy tomatoes. Heat olive oil in a large deep pan. Add the garlic whole and fry for about 2 minutes to flavour the oil. Add the tomatoes and fry until they burst. Season with salt & pepper. Tear basil leaves in pieces and mix with the sauce. Cut slices of blue cheese and arrange on top of the pasta. Sprinkle with rocket and serve. My notes: A good quality store bought tagliatelle will also work well, if you don’t have a pasta machine. Overnight leg of pork, so soft that you can pull it with a fork. Photography by Tasha Seccombe. Preheat oven to 200 C. Place half the olive oil in a roasting tray. Place the pork in the bowl and sprinkle with the lemon juice. Rub the garlic all over. Season with salt & pepper, then add the rest of the olive oil. Place in oven with skin side down. Remove after 30 minutes, then turn the leg over with skin side up. Cover with foil. Lower heat to 140 C, then roast for 6 hours. Remove the netting around the meat, then add the bay leaves, wine, leeks and chestnuts. Roast uncovered for an hour at 180 C. Remember the skin won’t be crispy. The meat will be soft enough to pull apart with forks. My notes: The original recipe calls for leeks, which were unfortunately out of stock everywhere at the time of the shoot, so I substituted these with slices of red onion. I also couldn’t find chestnuts, but I’m sure these will be stocked at a good exotic speciality store. Custard tart with caramelized figs. Photography by Tasha Seccombe. Place the flour, sugar and butter in a food processor. Mix until the butter is well incorporated. Add the yolk and mix. With the motor running, add the water spoon by spoon, until it just comes together. Remove from mixer and cover with plastic wrap. Rest in the fridge for 30 minutes. Preheat oven to 200 C. Roll out dough on a floured surface. Line a greased 18 cm tart tin with the dough, then prick with a fork all over. Line with baking paper on top and fill with dried beans. Bake blink for 10 minutes at 200 C. Remove paper and beans and bake for another 5 minutes until the base is cooked. Whisk the yolks, cornflour, sugar and vanilla together with an electric mixer in a mixing bowl. Heat the milk and cream together in a pot, but don’t let it boil. Add the cream mixture to the egg mixture and mix well. Pour back into the pot, then continue stirring over medium heat until the custard thickens. (You don’t want to make scrambled eggs!) Pour the custard into another bowl and place a piece of wax paper on top to prevent a skin from forming. Let it cool to room temperature. Pour filling in baked tart base and bake for 20 minutes at 180 C. Let it cool overnight, preferable in the fridge. Put the sugar and water in a large pot with a lid and place over medium heat until the sugar has melted. Now remove the lid and let it boil until it reaches a light caramel colour. The caramel will continue to darken, so remove from the heat immediately. Carefully dip the figs into the hot caramel and place on a baking tray lined with baking paper to cool. Place on top of the cooled tart when ready to serve. This post was created in collaboration with Poetry Stores. For this Mothers Day feature, I had the opportunity to cook three recipes for a special tea table spread from Daisy Kristiansen and Leah Garwood-Gowers’ new book Raw Cake, available from Poetry Stores. They are the duo behind The Hardihood in London – raw, handcrafted, superfood confectioners. Products by The Hardihood are plant-based and free from gluten, refined sugar, dairy and soy. Conveniently vegan and often raw, they use organic, sustainable ingredients to craft “clean candy”. Being a self-confessed French pastry addict, it was hard for me to imagine a world of cakes without butter or sugar (or flour or eggs, for that matter). So I chose two recipes that really reminded me of the “good stuff” like rocky road and berry swirl cheesecake, as well as a recipe that tickled my fancy for the strange combination of ingredients like avo, mango & lime tart. It was an absolute revelation to make these recipes. For one, there were many ingredients that I’ve never heard of, like maca powder and rice malt syrup. The dairy-free “cheesecake” was made by blending desiccated coconut with soaked raw cashews, rice malt syrup, lemon juice, fresh berries and coconut oil (you need a pretty powerful blender to achieve the right consistency). The rocky road consisted mainly of superfoods like goji berries, dried apricots, pitted dates, organic cacao powder, coconut oil and lots of raw nuts. And the avo mousse tart with mango & lime had the most incredible texture that you can imagine. Unfortunately, most of these ingredients are not mainstream yet, but you’ll find them in good quality health stores with a relatively high price tag. The more familiar ingredients are easy to find, yet also expensive. If you don’t have serious budget constraints and want to reap the benefits of super healthy, raw food in the tastiest ways imaginable, this book is for you! Here’s to all the mothers out there aiming to feed their families the best. Happy Mothers Day! Tip: Shop your nuts at a weigh-and-pay shop – this way you only buy what you need, especially when a recipe calls for only 40 g of walnuts, etc. Line a 15 cm square baking tin with baking paper. Place all the dry mix ingredients in a high-powered food processor and pulse on high until just broken up and mixed together but still chunky. Transfer to a large mixing bowl and clean out the bowl of the food processor. Next, make the chocolate mix. Add the coconut oil, cacao, coconut sugar and syrup to the clean food processor and blend on high, then add the dates and blend until smooth and combined. Make sure you don’t over-mix the chocolate or it can separate. If this happens and there is a lot of extra oil, add in some more cacao powder and malt syrup until it becomes smooth. Pour the chocolate mix over the dry mix and stir together with a large spoon until well combined. Scoop into the baking tin, pressing the mixture down to ensure it is compact. Place in the fridge for 3-4 hours or the freezer for 1 hour until it has completely set, then cut into 9-12 pieces. They will keep well in the fridge for up to 7 days. My notes: My food processor wasn’t powerful enough to pulse the dried apricots, so I opted to cut them by hand instead. Also, I used a 20 x 13 cm baking dish and got 18 medium size squares – remember to really put pressure on the mixture when you compact it, otherwise it will be very crumbly. Blueberry Lemon Swirl Cheesecake – not containing and cheese or dairy or gluten! Make your cake look extra pretty with a selection of edible flowers. Catch the interesting ingredient list below. Photography by Tasha Seccombe. Line a 20 cm round springform cake tin with baking paper. For the base, place the nuts in a high-powered food processor and blend on high until coarsely ground, then combine with the remaining ingredients until well mixed. Press into the cake tin. For the filling, place the coconut in a high-powered blender and blend on high until fine, then add the cashews, syrup and coconut oil and blend again until the mixture is as smooth as possible, scraping down the sides to incorporate all the mixture. Transfer half the mixture to a bowl and set aside. Add the lemon juice, zest and turmeric to the mixture left in the blender and blend until smooth. Taste, and add more lemon juice if it needs more flavour, and more sweetener if it’s too tart. Pour into a second bowl, setting aside a few tablespoons of this lemon cream in a piping bag to chill for later. Add the other half of the mixture to the blender with the blueberries. Blend until combined and add more sweetener if needed. Pour it back into the bowl so that you now have two bowls with two colours mixture. Spoon equal sized dollops of the purple mixture and the yellow mixture at random onto the cake base, alternating between colours, until you have used it all up. Wiggle the tin from side to side to settle the mixture, and swirl through the mix using a knife or a chopstick, to create a pattern. Transfer to the fridge overnight or the freezer for 3-4 hours until firm. Remove from the tin and decorate with the lemon cream, edible flowers, coconut flakes and lemon zest. Chill until ready to serve. My notes: Use a very powerful food processor / blender to achieve a smooth texture for the cheesecake mixture. Use the turmeric powder with caution, as it can tint the mixture very bright yellow. Mango, lime and avocado mousse tart. Photography by Tasha Seccombe. Line a 20 cm round pie tin with baking paper. First make the crust. Place the nuts in a high powered food processor and blend on high until broken up. Add the remaining ingredients and blend again until well combined and the mixture sticks together. Press into the pie tin, and clean out the bowl of the food processor. For the filling, blend the avocados in the clean food processor until smooth. Add the remaining ingredients and blend until everything has been broken down and the mixture is silky smooth. Pour over the base and place in the fridge for 2-3 hours to set. My notes: I used a fluted pie tin which is very difficult to line with baking paper. I used a non-stick baking spray instead. This post was written in collaboration with Poetry Stores. All homeware, linen and the cookbook available online and in store at Poetry Stores. A collection of Roman-style recipes from Eleonora Galasso’s new book As The Romans Do, available from Poetry Stores. Photography by Tasha Seccombe. Rain or shine, summer or winter – Italian cooking wins my vote every single time. There’s just something generously simple about the food culture of Italy: not too many ingredients, comforting and robust, fragrant and delicious. I recently had a look through Eleonora Galasso’s new book As The Romans Do: La Dolce Vita in a Cookbook – Classic and Reinvented Recipes from Rome, available from Poetry Stores. The book is positively vibrant, filled with familiar Italian favourites like saltimbocca, panzanella, semifreddo, various pastas and porchetta. She puts a playful twist on many of the recipes, accompanied with excellent photographs of the dishes as well as her beautiful surrounds in Rome. She’s an international Instagram sensation, so her pictures are stunning. Here are three of Eleonora’s recipes – easy and accessible enough to make all year round. In the photographs you’ll see some of Poetry’s new black and gold tableware that made these vibrant dishes look even more delicious. Everything is available online and in store from Poetry – look out for the noir and petra ranges. Pizette Rosse. Photography by Tasha Seccombe. Recipe from As The Romans Do by Eeleonora Galasso. To prepare the dough, sift the flour into a large mixing bowl with the sugar. Dissolve the yeast into 250 ml lukewarm water, add it to the flour and sugar and mix together for 5 minutes. Add the butter, oil and salt and mix for a further 2-3 minutes to form a soft, sticky dough. Add up to 50 ml more water as needed, the goth should feel neither sticky not dry. Cover the bowl with a clean tea towel and leave to rise in a warm place for 1 hour, or until almost doubled in size. Preheat oven to 200 C. Mix the passata, basil, oil and salt together in a bowl and set aside. To make the pizzette, roll out the risen dough on a clean, floured surface, to a 1 cm thickness. 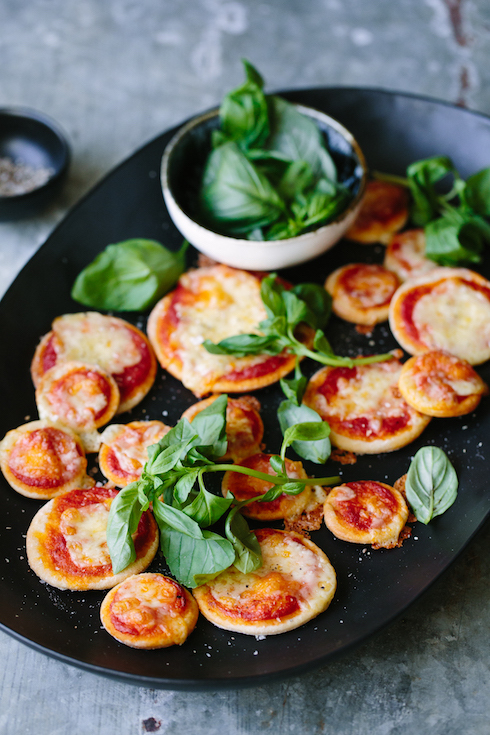 Press down on the surface of the dough with a small cup of glass of your choice to form your pizzette circles. Spoon a little of the passata over the centre of each pizetta, being sure to leave the edges empty so that you have that typical white/red contrast of a good margherita. Cook in the oven for 15-20 minutes, adding a few mozzarella cubes to the top of each pizzetta halfway through cooking, until the cheese is bubbling and the pizzetta bases are crisp. Enjoy. My notes: I prefer the pizzette a little thinner, so I roll out the dough to a thickness of 5 mm. Panzanella. Photography by Tasha Seccombe. Heat 2 tablespoons of olive oil in a large non-stick frying pan over high heat. Add the bread pieces and fry, turning occasionally, for 5 minutes until crisp and golden all over. Remove from the heat and set aside. Place the tomatoes in a bowl and pour over boiling water to cover. Leave for 1-2 minutes, then drain, cut a cross at the stem end of each tomato and peel off the skins. Cut the tomatoes roughly into 5 mm cubes, discarding the seeds. Slice the onions and place them in a bowl of cold water for 10 minutes. Drain and dry on a clean tea towel. In a salad bowl, mix together the sliced onions, chopped cucumber, celery, tomatoes and olives, then add the chopped rocket an basil leaves, pour over the vinegar and the remaining 2 tablespoons of oil and season with salt & pepper. 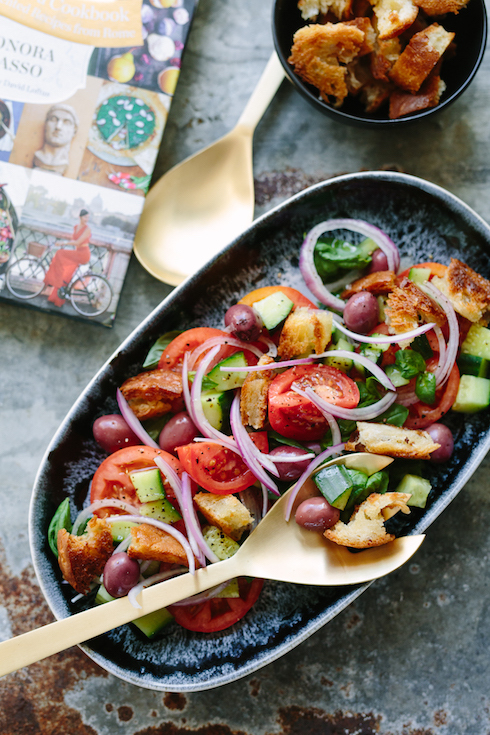 Finish the panzanella by adding the toasted bread pieces and giving everything a final gentle mix to ensure the bread is covered in all the juices. This salad is delicious served immediately, or you can keep it in the refrigerator for up to 3 days, letting it absorb the mix of aromatic flavours. Scatter over the pecorino before serving. My notes: Peeling and deseeding the tomatoes are not always necessary – I love serving them unpeeled and with seeds. I also love serving the herbs and olives whole and not chopped. Braised sausages with lentils, leeks & fennel. Photography by Tasha Seccombe. Warm the oil in a frying pan over medium heat, add the leek and fry for 5 minutes until softened and translucent. Add the fennel and sausages and cook for 5 minutes until the sausages are browned on all sides. Add the lentils to the pan and pour over the stock. Bring to a boil, then reduce the heat to a gentle simmer and leave to cook for 25 minutes, or until the lentils have softened and the sausages are cooking through. 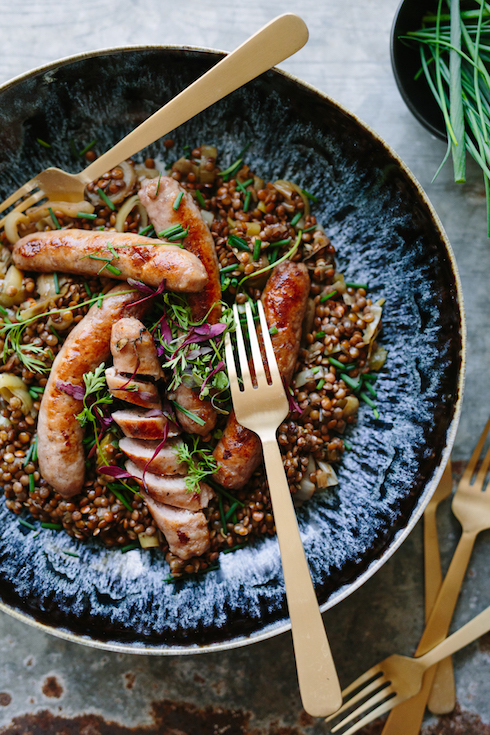 Divide the lentils and sausages between plates and scatter over the fennel seeds and chopped chives to finish. Serve. My notes: I used black lentils. Pan fried gnocchi with crispy sage and brown butter on blue cheese sauce. Bliss in a bowl. Photography by Tasha Seccombe. Some classic dishes are not to be tampered with. They are beautiful in their simplicity, their uncomplicated perfection, their timeless deliciousness. I feel that way about potato gnocchi with blue cheese sauce. It was the very first recipe that I’d published on my blog www.thefoodfox.com on 21 January 2011. Over the past few years since that post, I’ve published hundreds of recipes, cooked MANY batches of gnocchi (not only for myself but also for groups of guests while catering) and learned that you always return to simple, old favourites. I’ve also learned that making gnocchi is not as difficult as everyone says. You just need to “understand” your potatoes and know that they are going to react slightly differently each time (the texture and water content will be different for every single batch). Once you get the hang of the consistency in the dough, the rest is truly child’s play. I often make potato gnocchi with blue cheese sauce at home for my family. I sometimes add a swirl of truffle oil or a drizzle of sage butter, but you don’t even need to. I mostly boil the gnocchi, but some days I prefer golden pan-fried nuggets of plush pillowy potato. Serve them straight from the pan as they can slightly lose their crispy exterior texture on standing. Note: For the blue cheese sauce, I prefer using a strong-flavoured gorgonzola-style cheese. The blue veins of the cheese don’t completely melt into the cream, it remains delicately textural. The sauce always looks a little too runny at first, but be patient – when you serve it in bowls with the gnocchi, it is just right. Leave the salt & pepper up to your guests as the cheese can sometimes be very salty already. Making potato gnocchi is not difficult once you get the hang of it. Photography by Tasha Seccombe. Boil or bake the potatoes until they are completely tender. Cool slightly and remove the skins (in Italy they believe that cooking the potatoes in their skins add a lot of flavour to the gnocchi). Press the cooked potatoes through a sieve (this is a laborious process, but the end result is well worth it) or use a potato ricer to create finely minced potato. Place the fine potatoes in a mixing bowl, then add the egg, salt, pepper and half of the flour. Use a fork or spoon to mix it, adding more flour as you need it (you might not need it all). Turn it out on a floured surface and delicately knead the mixture until it forms a ball that resembles smooth bread dough. Do not over work the dough – you’re looking to create a smoothly textured potato dough that is not lumpy but just kneaded to the right consistency. Divide the dough into 8 pieces, then roll out each piece on a large floured working surface, one at a time, into a long sausage shape of about 2cm thick. 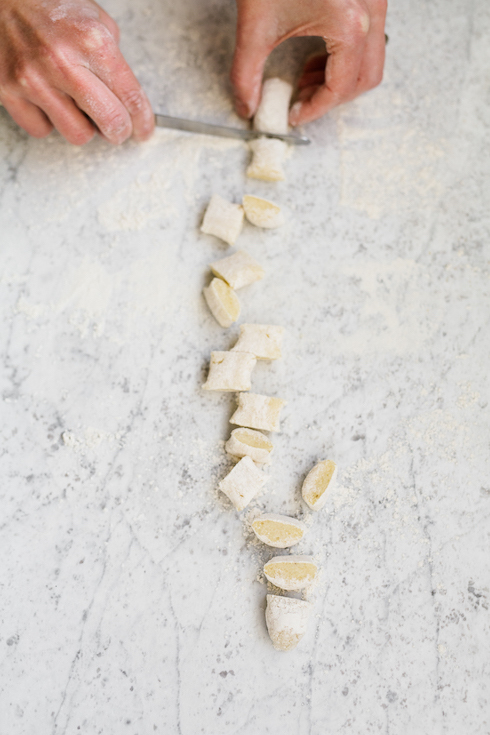 Use a knife to cut each strand into gnocchi, flicking the pillows as you’re cutting (so that they don’t stick to the knife or to each other). Quickly toss in a light coating of flour, then pan-fry in butter on both sides until golden (about 1-2 minutes a side). Serve with blue cheese sauce. Place the cream in a small sauce pan over high heat. When it just comes to a light simmer, crumble the blue cheese into the cream and turn down the heat to very low, stirring for a few minutes until the cheese is completely melted. Pour a pool of sauce into bowls, then top with pan-fried gnocchi (and optionally some crispy fried sage leaves and a few drops of truffle oil or extra virgin olive oil). 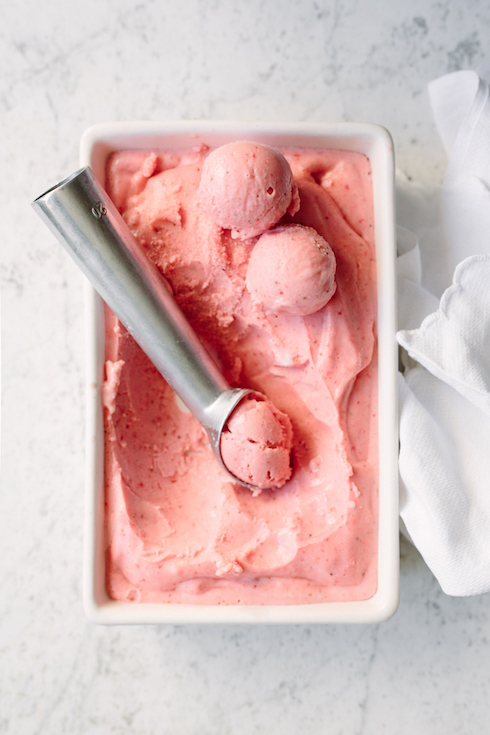 If there’s one dessert that everyone loves in the hotter months, it’s ice cream. 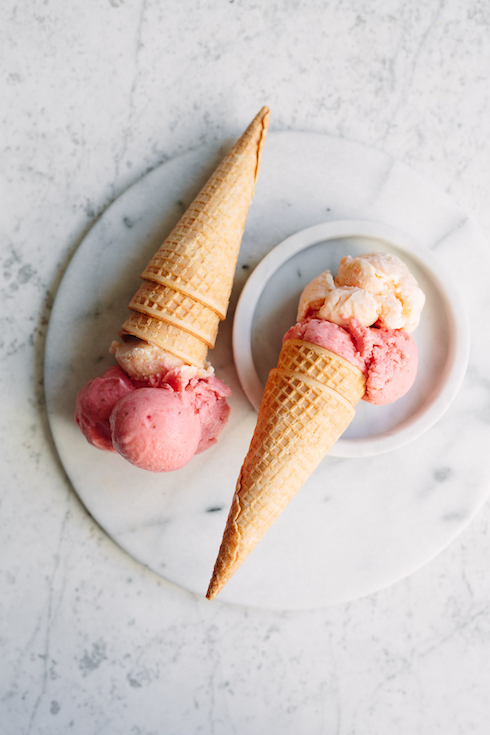 Dreamy cones of delicious, ice cold creaminess. Unfortunately most ice creams are quite rich in calories (because good ice cream really needs lots of cream) and sugar. If you’ve ever tried making your own, you probably know that a proper home-made custard in a proper churner works best. But very few of us has ice cream churners at home, and very few of us will take the time to make a custard from scratch to start with – it can be quite intimidating. Although I have to mention: the end result totally justifies the effort. So what’s the alternative? If you really want to enjoy a homemade cold treat with half the effort and more than half the kilojoules, try this: an easy frozen yoghurt made from freshly frozen chunks of banana and other fruit, double cream yoghurt and honey. Whizzed in a food processor (or blender). That’s it. I’ve seen various versions of this mixture all over the internet, but the basics stay the same. Cut fresh banana and fruit into smallish chunks, freeze in a single layer, pop into your processor with the yoghurt and honey, and give it a whiz. The banana is essential as it provides the smooth, thick texture that we all associate with proper ice cream. It’s all natural, it’s beautiful, and it tastes delicious. Place the banana and fruit on a small tray in a single layer. Freeze for 2-3 hours. Place half the frozen fruit with the yoghurt and honey in a food processor. Process until the mixture is smooth and thick, then add the rest of the fruit and blend. It should resemble soft serve consistency. Taste and add more honey if needed. Place in a plastic container with lid, then refreeze for at least 3 hours until ready to serve. Note: If your food processor is struggling to process the frozen chunks, start by adding a few chunks at a time with the yoghurt, continuing until all the fruit is mixed. A stronger machine works easier. PS: Frozen fruit that have spent more than 3 hours in the freezer might become very hard to process with regular smaller machines. Leave them out of the freezer for 15 minutes before processing. When I was a student, there used to be a place in Church Street called Spice Café that served various soups daily with a slice of bread of your choice. They used to make the most delicious butternut soup – extra thick, super smooth and very creamy. I used to order two bowls in one sitting, my gluttonous nature taking charge. Although butternut soup has become something of a retro classic (even hated by some), it remains one of the most comforting meals to eat. There’s a school of soup makers that relishes the simplicity of the-two-ingredient-butternut-soup (butternut and cream), but sometimes that can resemble baby food. I prefer a soup made with roasted sliced young butternut, scattered with brown sugar, cinnamon & cumin. I add an onion and a small stick of celery, some good quality stock and fresh cream. If you’re in the mood for a special touch, reserve the seeds of the butternut and roast them with more spices to create a delicious crunchy topping. 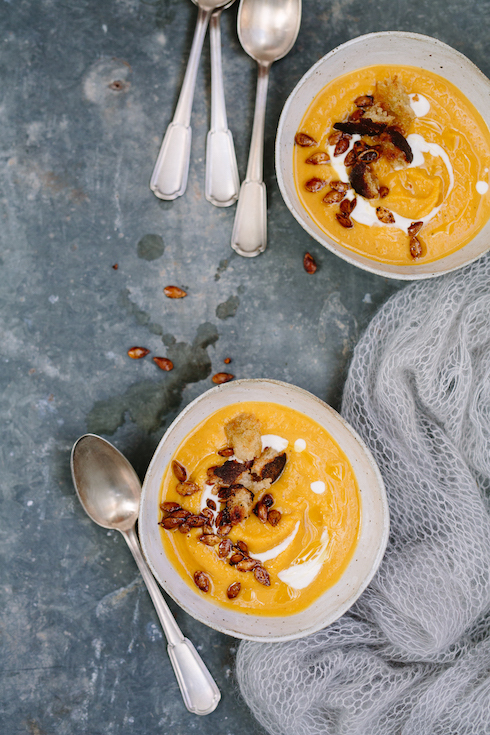 Here’s to the ultimate thick butternut soup – such a meatless Monday favourite. Enjoy! Pre-heat oven to 220 C. Arrange the slices of butternut , onion and celery on a large baking tray lined with non-stick baking paper, preferably in a single layer. Drizzle with olive oil then season with salt & pepper, cinnamon, cumin and brown sugar. Roast for 30-45 minutes until the edges start to caramelize and the butternut is tender. Place the roasted veg plus all the roasting juices in a deep medium size pot, then add the stock and cream. Use a stick blender and process to a very smooth pulp. Adjust seasoning and add more stock or cream, if necessary. Reheat just before serving. Tip: If you prefer an ultra smooth texture, push the soup through a fine sieve after blending. 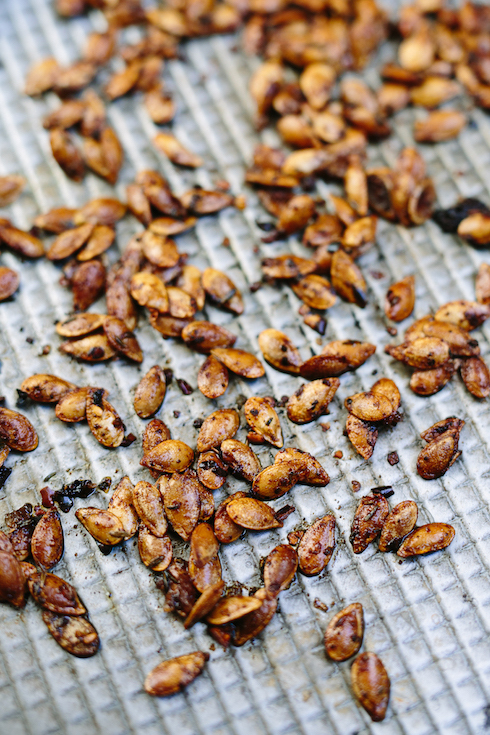 Pre-heat oven to 180 C. Remove most of the stringy bits from the seeds, then rinse them under cold running water. Drain well and pat dry. Arrange the seeds on a baking tray, then drizzle with olive oil. Season with salt & pepper, then scatter with paprika, thyme & chilli flakes. Roast in the oven for 10-15 minutes or until golden brown and fragrant. Let it cool on the tray, then store in a glass jar with a tight fitting lid. 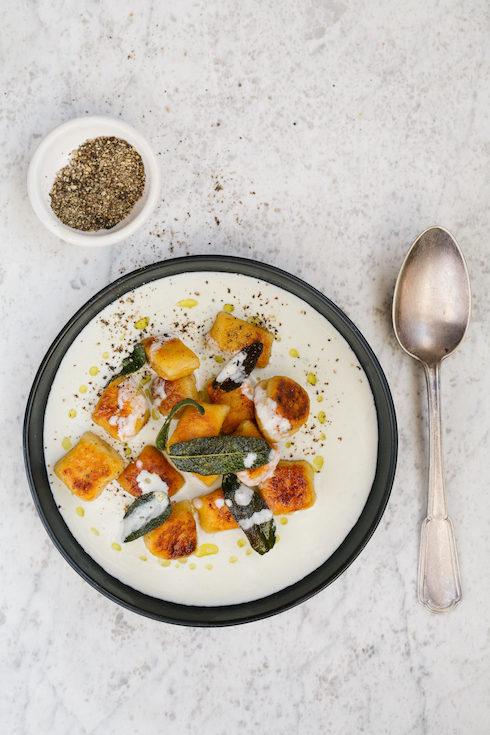 Serve the soup in bowls with a swirl of cream, a drizzle of extra virgin olive oil and some toasted seeds. There is something really beautiful about a pizza topped with only one colour – in this case green. I’ve made hundreds of pizzas in my life, mostly with a traditional red tomato base sauce and some without the sauce (a white pizza, also called pizza bianca). So technically this is a white pizza topped with green ingredients and no mozzarella, only a few chunks of Danish blue cheese (with a greenish colour). I’ve added a mixture of green ingredients with really intense flavours, like very salty capers, fresh peppery greens and earthy broccoli. The broccoli and blue cheese really works together, especially when they get all toasty in a very hot oven. If you don’t like broccoli or any of the stuff I’ve chosen, just substitute it with your favourite green veg and leaves and give it a try. It’s a fabulous informal starter, cut into squares or slices, but also a great light lunch or supper. Mix the dry ingredients together in a large mixing bowl. Add the water and mix with your hands until it starts to come together, then press into a ball and start kneading. Knead to a smooth soft ball of dough, about 5-10 minutes. Oil the inside of a clean large bowl, then place the dough in the bowl and cover with plastic wrap. Leave to stand in a warm place to rise until doubled in size – about 30 minutes. Pre-heat oven to 230 C.
On a clean surface dusted with flour, divide the dough into 2 or 3 balls, then roll out each one with a flour-dusted rolling pin until very thin. Transfer to a large baking tray lined with non-stick baking paper. 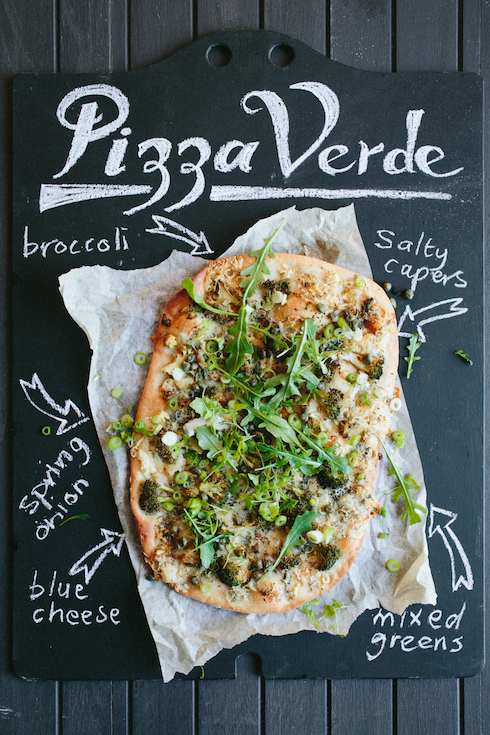 Top the pizza dough with small broccoli florets, crumbled blue cheese and capers. Bake at 230 C for around 7 minutes (or until golden brown on the edges), then remove from the oven. Transfer to a wooden board, then top with spring onion, fresh green leaves and a drizzle of olive oil. Serve at once. 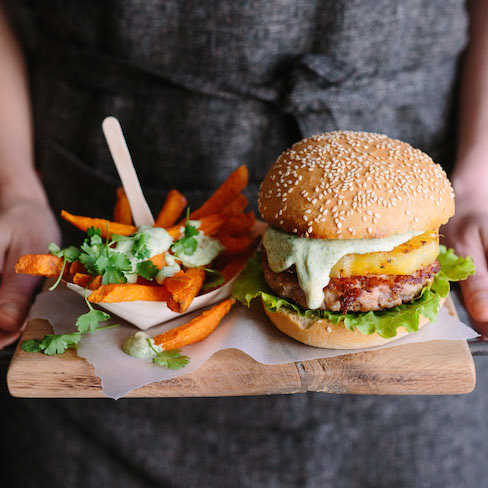 If you love great burgers, you’re in for a treat. Making patties out of great quality pork mince results in a much softer patty than ground beef, delivering a really awesome texture that’s almost marrow-like. They’re seasoned with smoked paprika and ginger, paired with a slice of grilled fresh pineapple and topped with a dollop of creamy coriander mayo. Add some crispy iceberg lettuce and a buttery, golden, toasted sesame bun. This might be one of the best tasting burgers I’ve ever made. This recipe is the last in a series of six that I’ve developed in association with Pork 360. It’s a quality assurance and traceability certification – a guarantee to both the consumer and retailing sector that the producer has a consistent production process that complies with minimum standards and ensures high-quality pork. The Pork 360 projects takes place under the guidance of the South African Pork Producers Association (SAPPO). Watch their video for more info. In a nutshell: it’s pork you can trust! You will find all of the listed ingredients at your local Food Lover’s Market. Look out for the Pork 360 mark/logo on the pork products. For the patties: In a mixing bowl, add the pork and season generously with salt & freshly ground black pepper. Add the smoked paprika, ginger and onion and mix well using clean hands (or a fork, if you prefer). Divide the mixture into four and shape into flat disks. I like placing them on pieces of grease-proof baking paper for an easy transfer to the pan later. Always remember that meat will shrink and pulls to its center in the pan, so make each pattie a little wider and flatter than you think you should. Set aside. For the herb mayo: mix the mayonnaise, coriander and lemon juice together with a fork (for a smooth result, process in a food processor). Set aside. Toast the buttered insides of the buns in a hot pan until golden and crunchy. Transfer to plates, then top the bottom halves with lettuce. Add olive oil to the hot pan and fry the patties on both sides until golden brown and cooked. Remove from the pan to rest while you fry the pineapple. In the same pan, quickly fry the pineapple slices in a very hot pan until charred on either side. 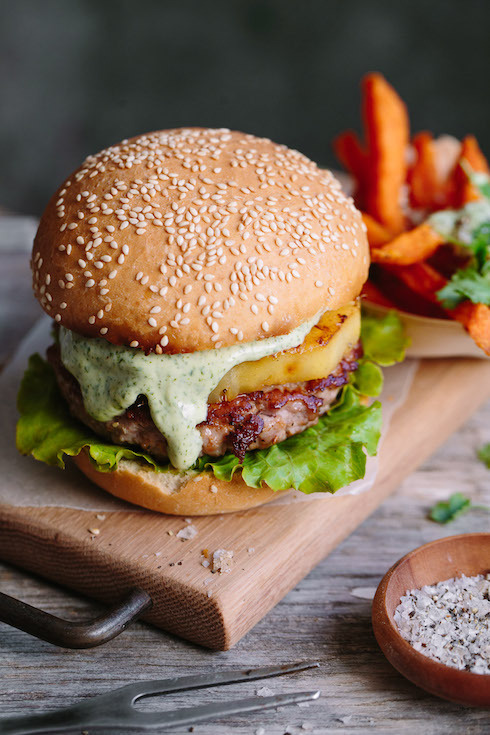 Place the rested patties on top of the lettuce, then top with a slice of fried pineapple and a dollop of herb mayo. Place the sesame bun halves on top. Serve immediately with or without fries. Note: the patties firm up quite a bit when cooked, so don’t worry about adding an egg to the mixture – it’s not needed.